So called SMT it's a continuation of SD and SM lines (called SE for export). 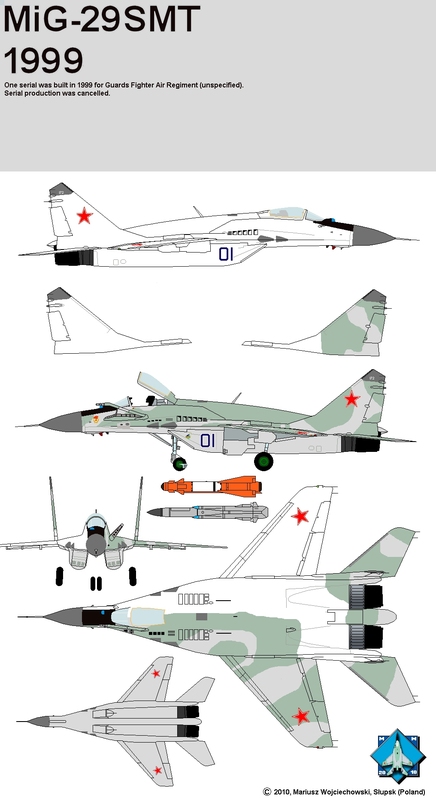 Each MiG-29SMT prototype has different configuration and dorsal fuel tank. Three aircraft were involved in 9-18 SMT programme and one serial was produced. 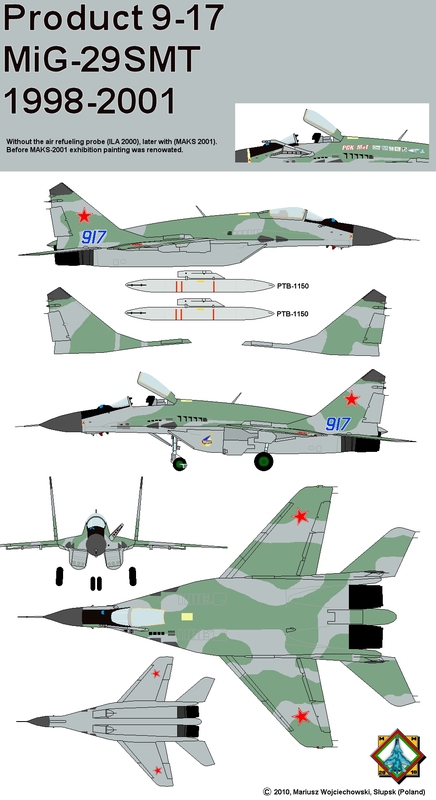 Projected trainer version is called MiG-29UBT (9-52). First, in Summer 1997 was build a non-flying mockup, using an old 9-13 airframe, as demonstrator of the working avionics and so called glass cockpit, also with added dorsal fuel tank, for the first time on MiG-29. 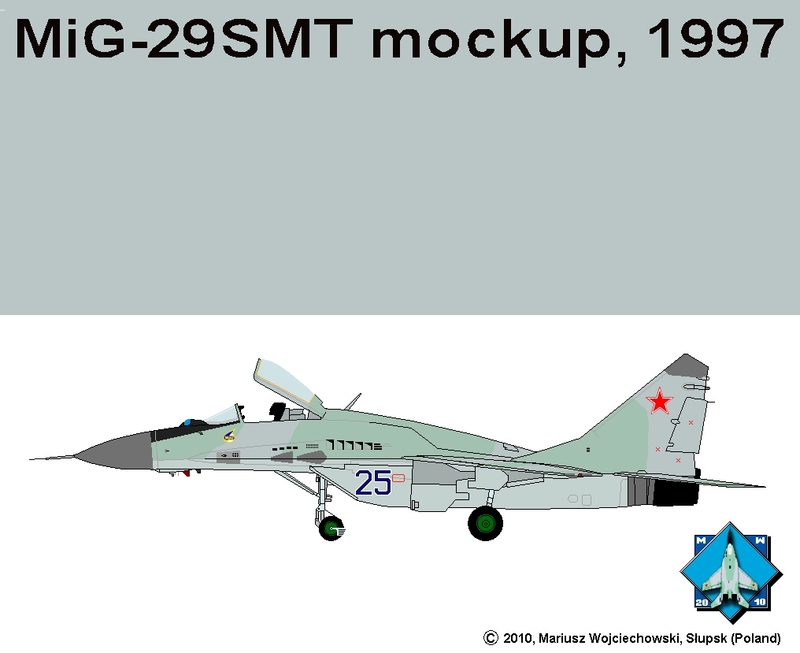 MiG-29SMT mockup #25, 1997. Drawing accuracy: 100%, but only left side on drawing! Aircraft #331 (airframe 9-13), belongs to MAPO MiG, was used in 1995 as prototype of SM version. In the end of the 1997 was rebuilt. In November 1997 aircraft take first flight with next time modernized avionics (designed by Mikhail Korzhuyev from Russkaya Avionika and MiG) and cockpit, and added larger than in #25 dorsal fuel tank, not really integrated, because dorsal air brake was already blocked by the tank. After some improvements and installation of larger tank (air brake still blocked), aircraft was renumbered to #405 - in Spring of the year 1998. Later in-flight refueling probe was installed. But still it was an experimental aircraft. Experimental #405 in Summer of the year 1998 with fuel tank which blocked the air brake! Drawing accuracy: 100%. In Summer 1998 was completed first prototype of the MiG-29SMT #917 with even larger fuel tank, with not blocked air brake (brake is on the tank), without in-flight refueling probe (installed later, in 2001). First flight July 1998 with Vladimir Gorbunov on controls. In 1999 was presented under designation SMT-1, in 2000 after change of the avionics systems under SMT-2. Avionics are still designed by Russkaya Avionika. Radar N010MP. First fully equipped prototype of the MiG-29SMT #917 in 1998. Drawing accuracy: 100%. Serial production of MiG-29SMT was planned, a batch of 20 MiGs of the Russian air force should be converted, but it never happens. One and only MiG-29 from RuAF inventory was rebuilt to SMT standard in 1999 (first flight Deceber 1998), new bort number #01 (small #172 on top of the fins). A fate of the #01 after 1999 remain unknown. Serial production was cancelled in 1998 and line 9-17 (big hump back with two fuel tanks inside) stopped. Second aircraft #51 - converted in 121st Air Rapair Plant - was never finished. 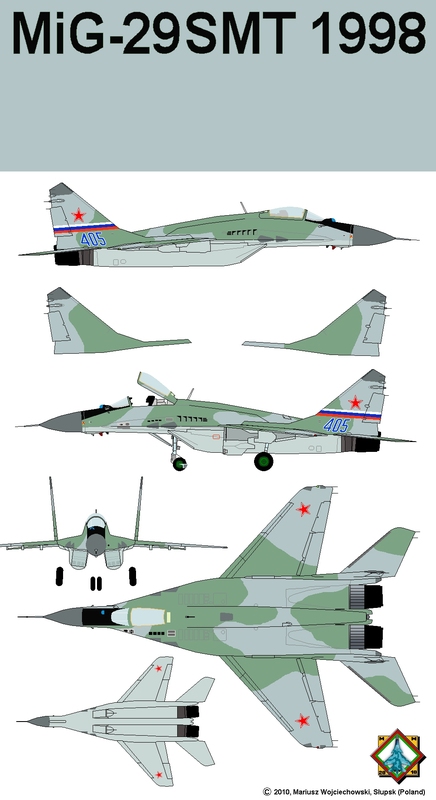 In 1999 only one serial MiG-29SMT was produced for unspecified guards regiment of the Russian Air Force. Drawing accuracy: right side and right wing unknown. 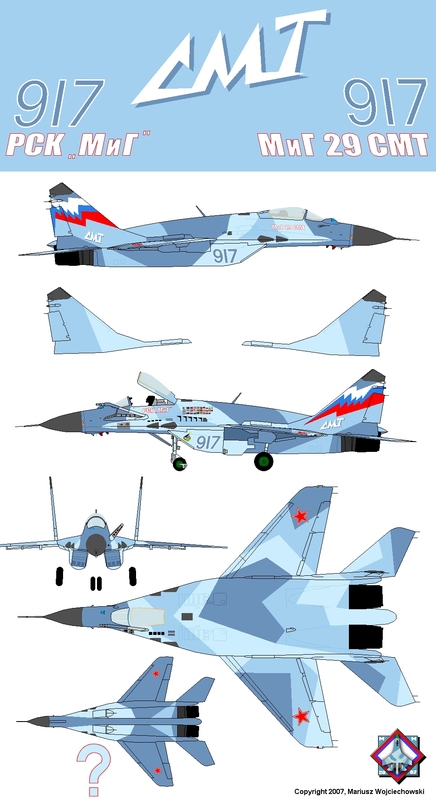 In next years a prototype #917 was used by MiG bureau to promote of the MiG-29SMT for export, displayed in many, many countries all over the world (see flags on fuselage). But in 1999 it was the end of the 9-17 line and double-seater 9-52 called UBT. Aircraft #917 in 2005, nicely repainted. Radar N010 Zhuk-M/ME. Camouflage is amazing, painted even on the bottom of the aircraft. Drawing accuracy: 100%, except bottom between engines.